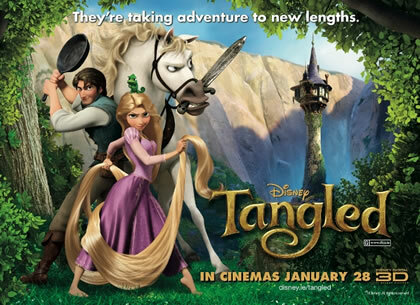 Tangled is yet another example of Disney taking a classic fairy tale and turning it into a thoroughly enjoyable film. Complete with great scenery, fun songs, and interesting characters we get a wonderful movie that’s fun for all ages. Rapunzel is adorable, Flynn is cheeky, and Mother Gothel is not only devilish but extremely hilarious. All in all, this is the perfect film to enjoy with some fun themed recipes. One of the foods referenced in the movie is hazelnut soup, which Mother Gothel says is Rapunzel’s favorite. I found this recipe online to make my own hazelnut soup (except I skipped the fennel since I don’t like it). I wasn’t sure how it was going to come out but it was very smooth and creamy. I discovered that I’m not too fond of such a nutty taste in my soup, but if you do like that sort of thing then definitely try out a hazelnut soup recipe of some sort, especially to go with the film. For our main entrée I went with the theme of “hair” and made angel hair pasta. I ate it with a vodka tomato pasta sauce that gave the dish a nice pink color to compliment the film. To make the meal healthier, we added a side of mixed vegetables. To top it off, we made a pink drink embellished with Twizzlers (because to me, they resemble braids like Rapunzel’s). For dessert, I came up with what I believe to be a brilliant idea: challah bread. The braided shape and warm color of the bread is perfect to mimic Rapunzel’s long golden braid. I even added decorative candy flowers to make it more similar to the scene where Rapunzel and Flynn are in the boat. There are hundreds of challah recipes out there (and plenty of yummy store brand ones as well). I wanted to try and make a vegan version and, although I was skeptical with how it would turn out, the result was fantastic. I used this recipe but added some cinnamon and other spices to the batter, as well as a cinnamon sugar glaze (made with melted Earth Balance butter). After a few hours, the bread finally came out and it looked amazing and tasted delicious. This was one of my favorite Disney-inspired food items to make yet. This was one of my favorite installments of Disney Dinner and a Movie. Not only is Tangled a fantastic film, but it presented me with some great recipes, some more interpretive than others. I especially loved the challah bread. Another great meal made possible by the creativity and inspiration of Disney! ← Movie Review: Does ‘Shrek’ Hold Up? Fantastically creative stuff for one of the best Disney movies in the last 10 years, love it!